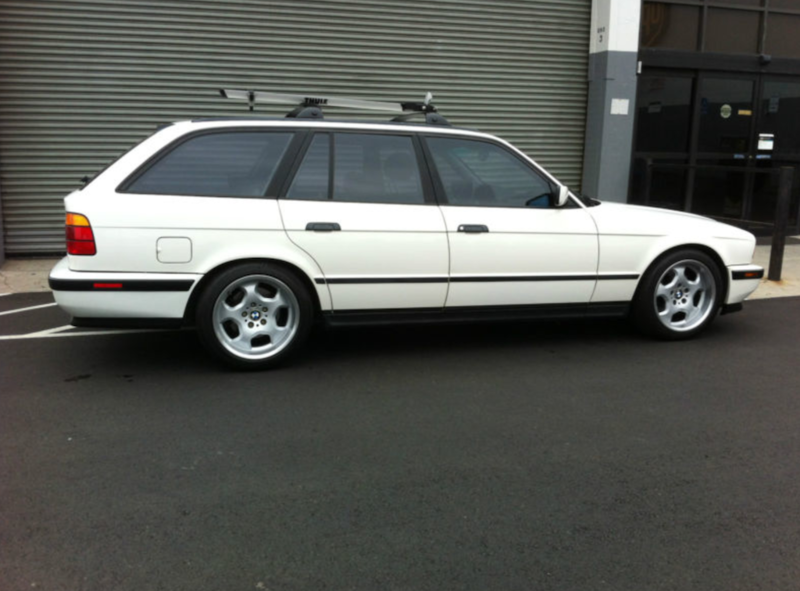 If you liked the BMW 540i M-Sport we featured a few days ago, but need a bit more cargo space, youâ€™re in luck. 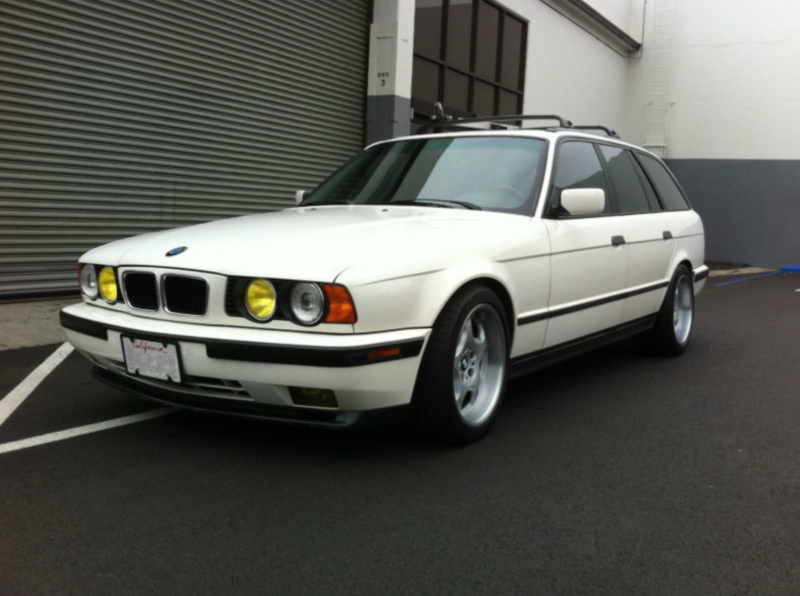 A 1994 530i Touring in the same hue of Alpine White with some M5 appearance pieces tastefully added. Under the hood youâ€™ll find the smaller, 3.0 liter M6 V8, coupled to a 5-speed automatic transmission. Itâ€™s getting harder to find these E34 Tourings in good shape. With under 100,000 miles, this example for sale in Los Angeles is a great piece for five-door fanatics. 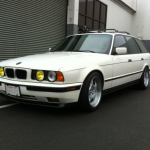 The Touring has all its original paint, with exception of the rear M-Tech bumper and the front bumper from an Alpine White M5 of the same year. The sheet metal is dead straight. It does not have a single dent or ding on it anywhere. Not one. It is 100% rust free. The paint shines bright. It does not have any scratches or gouges. The clear coat is 100%. There is some slight “ghosting” on the tailgate where the original 530i emblem used to be. All the trim is original and intact. Window trim is very nice. Rocker trim is very nice. Door handles are very nice. The Shadowline trim tape was professionally installed and looks great. The only small area of trim wear is the passenger side roof rail which shows some minor pitting. 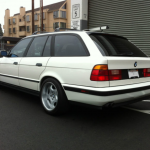 Original rear bumper has been replaced with an OEM BMW M5 bumper imported from Germany. It is excellent. Front bumper is very nice with minimal wear and some chips on the lower lip. Front bumper trim on driver side has a small scrape (see photo). Original headlights and surrounds are very nice, very clean. Taillights are also very nice with no chips, cracks or fading. Glass is beautiful, with no pitting or scratches. The front windshield was replaced and is less than 1 year old. The tint is 3M and was done professionally. Original emblems are all intact but show some minor wear. 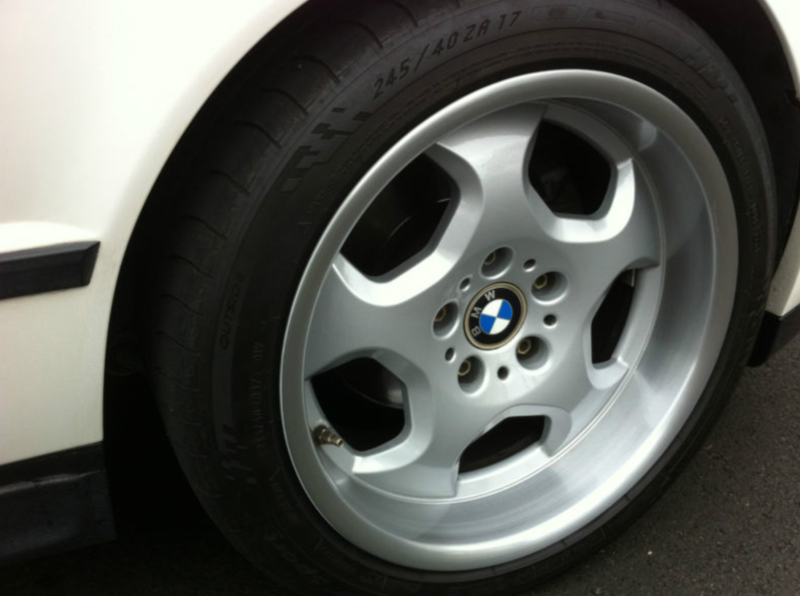 Wheels are recently refinished 17″ R.O.D M-Contour specific to the BMW E34. 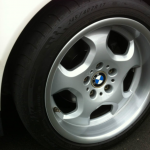 Fronts are 17×8.5″ and rears are 17×10″. Offset is specific to the E34, no spacers, adapters or anything else. Tires are Michelin Pilot Sport PS2s all around. Fronts are 245/40/17s, rears are 265/40/17s. (Original spare is in the trunk). The interior of this Touring is as nice as the exterior. Front and rear seats are absolutely beautiful. When I bought the car it had sheepskin seat covers over both front seats that had been on the car since day one so the leather is in great shape. Seat heaters work and seats do not suffer from the common “seat-twist” problem. Dash is very nice and does not have any cracks, splits, tears or fading. Gauges are nice and clear. 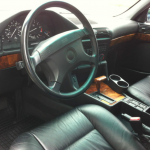 Original steering wheel is nice and is not cracked or heavily worn. All knobs are original and intact. Glove box is intact and lock works. Original radio is very nice. Original door panels are very nice. They are not splitting or separating (though the driver side rear looks like it was nicely repaired at some point in time). Carpet is very good and is covered by brand-new, high-quality German rubber mats that I just purchased. All original seat belts are in the car and are very nice. Original headliner is very nice. It is super clean. It has one small sag around one of the rear speakers. Rear cargo area is mint and looks like the it has never hauled anything. Rear seats fold down as they should to expand cargo area. Wood is good. A couple of pieces have minor cracks. I have custom refinished wood available with the Buy-It-Now option. The Touring fires right up and runs strong. The 3.0L V8 runs smooth as silk and is a blast to drive. Performance is aided by a Dinan chip. Handling is aided by performance suspension/H&R springs. The automatic trans functions properly and runs through all the gears as it should. There is no slipping or hesitation. Shifts sharp and crisp. The car does not hesitate, smoke, leak rattle, or exhibit any unusual noises or behavior. It tracks and stops great. There is probably $2,000+ worth of parts here. So, to be clear, if you do not choose Buy-It-Now, none of these items will come with the car. None of them. Not one. Bid with confidence. This is not my job, I am not a car salesman or a dealer. I am a collector and an enthusiast with 100% feedback. I have sold a number of clean, original California classics here on eBay. All of my buyers have been complete satisfied. I have tried to describe this car as accurately as possible but I’m sure I missed something. So, please don’t hesitate to e-mail me or call me (818-749-7764) with any questions you may have. The vehicle is offered in as-is condition with no warranty expressed or implied. You are bidding to own and your bid is a binding contract. The car is advertised locally so I reserve the right to end this auction early. 10% non-refundable deposit due by PayPal within 24 hours or sale. Remaining balance due within 7 days of sale. PayPal, cash, cashier’s check or wire transfer accepted. Buyer will be responsible for cost of shipping vehicle. 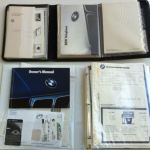 Seller can assist buyer in locating a reliable transport company. 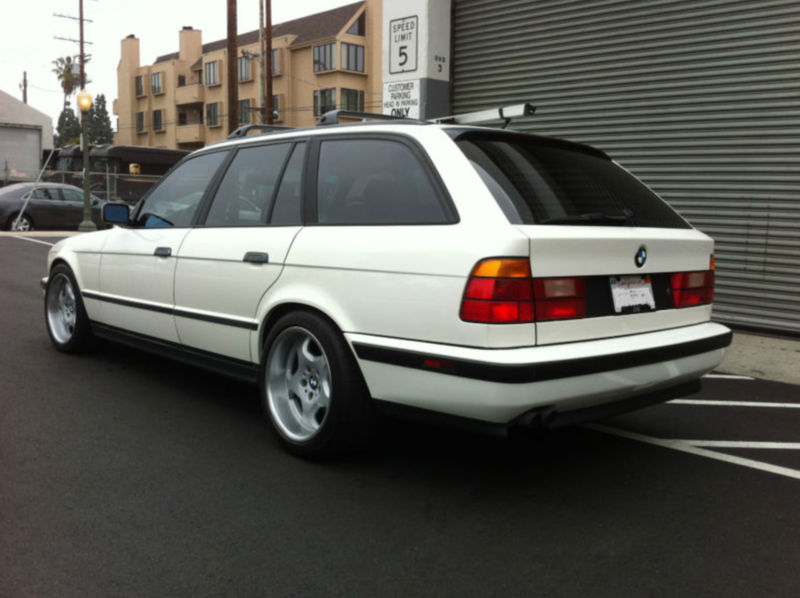 Even though the rest of the world had been enjoying the E30 3 series Touring for a few years, the E34 Touring was the first estate vehicle that BMW unleashed on the US market. 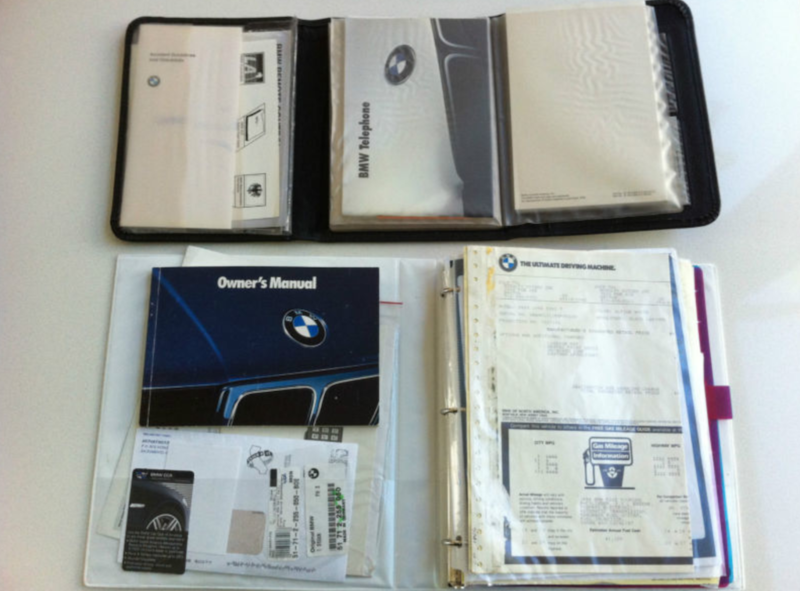 Sales werenâ€™t off the charts, but there was enough demand for the company to keep sending 3 and 5 series Tourings stateside for years to come. Considering the mileage and condition, Iâ€™d say this Touring is attractively priced, especially when you factor in the tasty M bits. 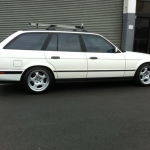 Tagged 1994, 5 series, 530i, 5er, BMW, e34, estate, m5, touring, Wagon. Nice looking car — looks like some potentially mismatched paint on the driver’s side. But wait, all that’s irrelevant because it’s a 530i. 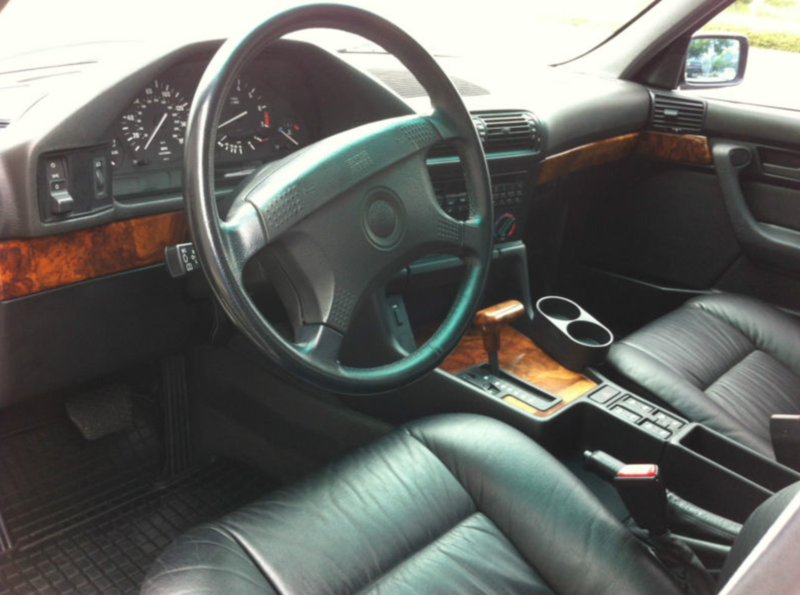 Pretty soon — irrespective of the most important considerations, the condition, cleanliness and service history of this E34 — there will be at least four or five posters comment on the uselessness of the 530i relative to the 535i, or that it is a wannabe car compared to a 540i. A beautiful interpretation of the BMW wagon. It looks absolutely sublime with this combination of paint, interior color, wheel selection and M5-flavored aero pieces, and would love to make it mine. Just awesome.